On a late spring afternoon, sixteen year old Jaron was on his way home from David Thompson Secondary School in BC, he was excited to see his father, who had just returned from a trip to China. Instead of a happy reunion, Jaron entered a shocking scene. “I heard yelling and I opened the door and I found my dad on the phone with 911 and my mom on the floor holding on to my sister. My sister was unresponsive and my mom was crying,” recalls Jaron. 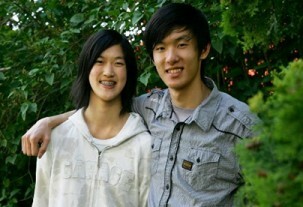 Jaron continued giving his sister CPR until the paramedics arrived. Lucy was defibrillated twice and then taken to the hospital, where she made a full recovery. What I didn’t know at the time was that my actions actually saved my sister’s life,” Jaron proudly recounts. The ACT High School CPR Program was made possible in Jaron’s school thanks to generous community and provincial-level support that enabled the donation of mannequins, teacher training and curriculum resources. The lead community partners for this community are the Kiwanis Clubs of Vancouver. Provincial partners of the program are BC Ambulance Service and the Ambulance Paramedics of BC – CUPE Local 873. The Advanced Coronary Treatment (ACT) Foundation is an award-winning, national charitable organization dedicated to establishing CPR in high schools across Canada. ACT raises funds to donate mannequins, teacher training, manuals and other materials to schools, and guides schools in program set-up and long-term sustainability. High School teachers teach CPR to their students as a regular part of the curriculum. More than 1.5 million youth have been trained in CPR through this lifesaving program to date. Health partners supporting the program in British Columbia and throughout Canada are companies in the research-based pharmaceutical industry: AstraZeneca Canada, Bristol-Myers Squibb Canada, Pfizer Canada and sanofi-aventis. They provide ACT’s sustaining funding and are committed to the Foundation’s national goal of promoting health and empowering Canadians to save lives.